The Dalite Professional Electrol is ideal for large screen applications in stage or auditorium settings. 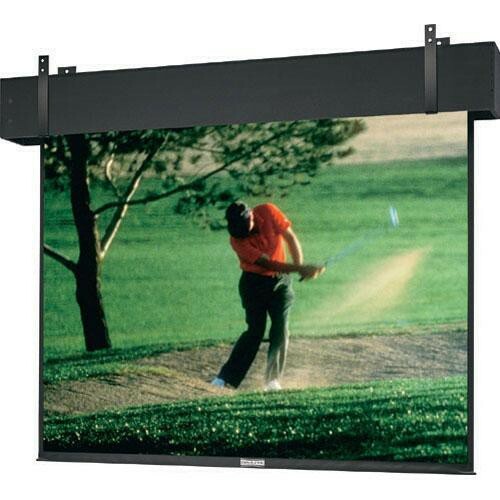 It's a heavy-duty screen for exposed or recessed installation without doors. It features a patented in-the-roller motor mounting system for quiet operation. Standard with a Decora style three position wall switch. Matte White fabric up to and including 16' will be seamless. Masking Options Black masking borders standard; Optional black or white "Extra Drop" to lower picture area more than normal. Maximum total drop 22' including picture area, except for 24' wide, where maximum drop is 18'. Box Dimensions (LxWxH) 231.0 x 12.25 x 10.25"